Inside every child is a superhero in the making. From dashing around the house with a tea towel as a cape. Solving mysteries and rescuing those in needed, there is something fantastic about being a superhero. Having grown up watching the Batman series on the TV he does tend to hold a place in my heart (especially when Christian Bale played him in the new films). With Mr. Boo a huge DC Comics fan it is inevitable that Tigger loves the different characters too. They have matching socks that they wear and sit happily chatting about the different characters abilities. With Tigger’s interest in DC Comics, you can imagine the look on his face when he saw the Batman playset sitting waiting for him in his room. 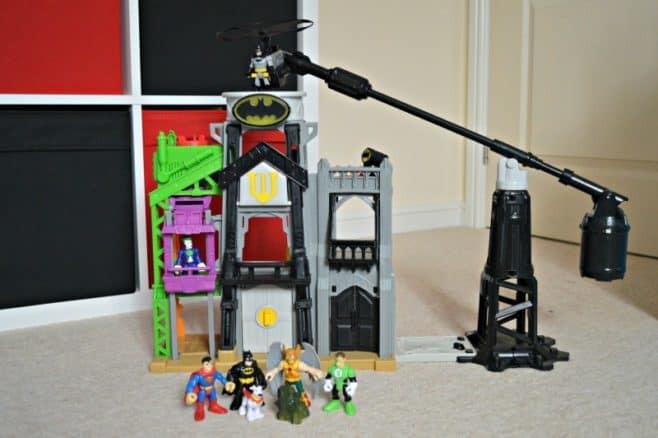 The Fisher-Price Imaginext Super-Flight Gotham City is a large playset that houses many different interactive features. Assembly the Fisher-Price Imaginext Super-Flight Gotham City is relatively easy, although you will require 6x AA batteries and a screwdriver. Once together the fun starts by seeing what each element of the Batman playset does. Turn top Power Pad to have Batman take flight – it works like a remote, providing 360-degree flying action! The main feature of this playset has to be flying Batman which can take a little getting used to for little hands. Turning the power pad to make him spin around either fast or slow. Moving the weight along the arm to determine just how high he can go too. 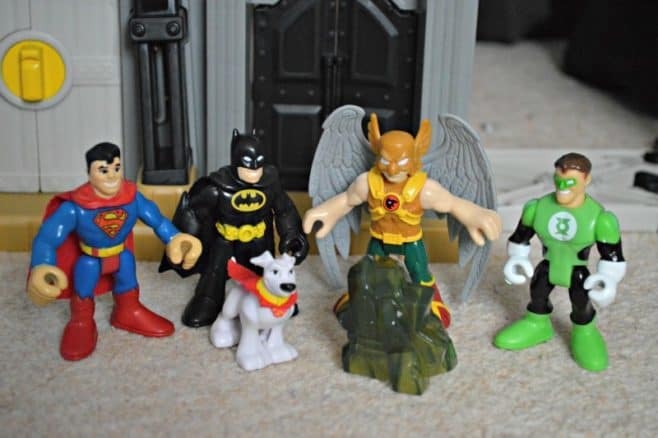 For added fun, why not add one of the Imaginext DC Super Friends figure packs. Tigger loved this set, happily sitting working out the different interactive features – especially flying Batman. With pies flying across the room from the Joker, the other DC Super Friends needed to take cover. Although the set comes with two figures which allow your little one to play with it straight away, I would say that purchasing an additional figure pack adds to the fun and allows them to enjoy more imaginative fun. The Fisher-Price Imaginext Super-Flight Gotham City is available to purchase from Smyths Toys, Amazon, and all other good toy retailers with a RRP £44.99.